Medieval Rome was uniquely important, both as a physical city and as an idea with immense cultural capital, encapsulating the legacy of the ancient Empire, the glorious world of the martyrs and the triumph of Christian faith. 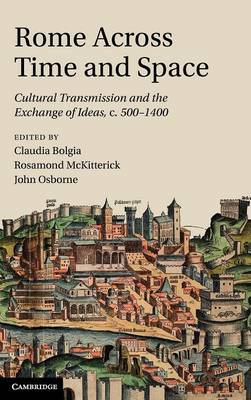 Rome across Time and Space explores these twin dimensions of 'place' and 'idea' and analyses Rome's role in the transmission of culture throughout the Middle Ages. Ranging widely over liturgy, architecture, sculpture and textual history, the authors focus on the mutual enrichment derived from the exchange of ideas and illuminate how cultural exchanges between Rome and its 'neighbours' (Byzantium, Italy, England and France), and within Rome (between Ancient and early Christian Rome and the medieval city) worked as catalysts for change, both to shape the medieval city and to help construct the medieval idea of Rome itself. The result is a rich and original perspective on a beguiling city with enduring appeal.